Update: the cast has just been announced. Click to the end of the article to find out more. Eight-year-old Tom Powers is no ordinary boy. He has extraordinary abilities thanks to the aid of a magic belt. Transforming into a superhero, he has amazing adventures in the majestic world of Treetopolis. Meet the newest star coming to CBeebies in the new Tree Fu Tom animation. 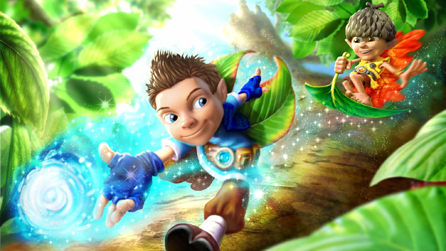 As Tom explores this fantastical playground with his magical friends, he interacts with viewers through the screen, inviting them on his action-packed journey of exploration and encouraging them to interact physically with his movement magic – called Tree Fu – to help him save the day. Tom has a set of magical moves called "Tree Fu". As Tom casts a magical spell and enters the world of Treetopolis, viewers join him on a series of adventures alongside the sprites, bugs and naughty fungi, known as Mushas, who inhabit this world. Alongside his faithful sidekick Twigs, Tom must harness the spectacular power of Tree Fu and, with the assistance of the audience at home, create Big World Magic to help his friends avert disaster and overcome the epic challenges of the magical and natural world. The show will air in 26 parts from early next year and is likely to also include online elements too. David Tennant will voice the lead character Twigs, with Sophie Aldred voicing Tom. Tim Whitnall will voice multiple characters: Zigzoo, Squirmtum and Rickety McGlum. Ariela will be voiced by Samantha Dakin. Treetog is played by Sharon D Clarke.